Slightly south west of Gilsland, a minor road follows the line of Hadrian's Wall from Birdoswald Fort to the tiny hamlet of Banks. En route it passes the remains of several turrets which helped defend the wall. 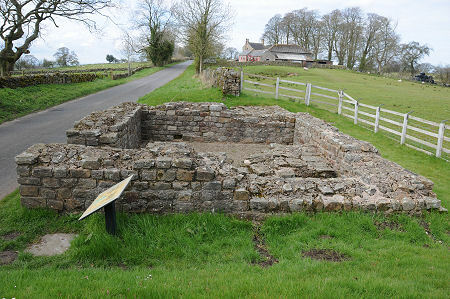 Two of these, Piper Sike Turret and Leahill Turret, or Turrets 51a and 51b respectively, can be found immediately to the north of the road a third of a mile apart just south west of the farmstead of Wall Bowers. 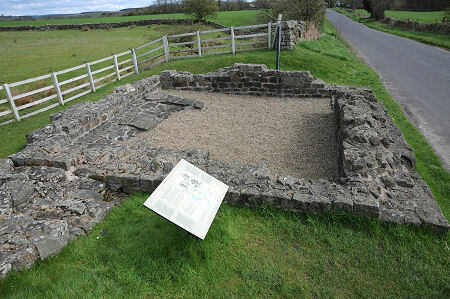 When the western 30 miles of Hadrian's Wall from Willowford to its terminus at Bowness on Solway was originally constructed in the 120s it was made of turf. The milecastles on this part of the wall were also made from turf, though the turrets were constructed from stone. The turf sections of the wall were later replaced in stone, probably within 10 years, though both of these turrets (like Banks East Turret a little to the west) were originally designed to be flanked by turf walls. It's worth noting that the designations of these turrets as 51a and 51b has nothing to do with its original builders. It's simply that when antiquarians and, later, archaeologists, began to explore Hadrian's Wall, they needed an unambiguous means of referring to the individual features along it. As a result all eighty of the milecastles built along the line of the wall, whether visible or invisible and whether known or assumed, were numbered from east to west, with the first, in Wallsend, being numbered Milecastle 1, and the last, at Bowness-on-Solway, being numbered Milecastle 80. Along much of its length, two turrets were built between each pair of milecastles, and these simply follow the numbering system of the milecastle to the east. Turrets 51a and 51b therefore fall between Milecastle 51, to the east, and Milecastle 52, to the west. No trace of either milecastle remains above ground. Turrets were fairly basic structures, and both Piper Sike and Leahill Turrets conform to a standard pattern, comprising a simple square building with a single door at the east end of the south wall. In both turrets there is a raised stone platform against the inside of the north wall, and it is assumed that this formed a footing for a ladder which gave access to the upper floor of the turret. The upper floor would have provided a viewpoint over the surrounding area and, especially, out to the north of the wall. But in truth, much more has to be assumed about the operation of the wall than is known for sure. It even remains a matter of debate whether there would have been a wall walk along the top of the wall or not. It is also open for discussion whether the turrets would have been topped off by an open roof above the upper floor providing a fighting platform, or by a pitched roof, or by a projecting walkway around the upper floor. What is more obvious is that each turret could only accommodate a small number of men at any one time in any degree of comfort. It also seems likely that the turrets, at least on this part of Hadrian's Wall, went out of use long before the rest of the wall, as no finds have turned up dated after AD200. Meanwhile at Leahill Turret, traces have been found of a lean to building erected against the inside of the south wall in the late 300s, suggesting that by that time the ground floor of the turret was open to the elements.